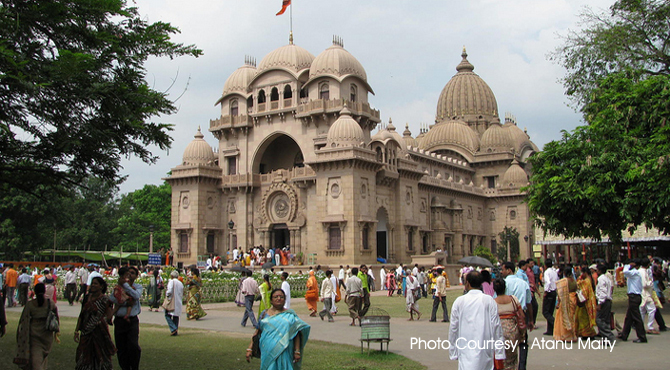 Belur Math is the the global headquarters of the Ramakrishna Math and Mission, a spiritual movement based on Vedanta. It is 16.5km from the Ramakrishna's beloved Kali Temple at Dakshineshwar. It is founded in 1899 by Swami Vivekananda, the world famous yogi and disciple of Sri Ramakrishna Paramahansa, who preached the unity of all religions. This International tourist attraction is located near Belur in Howrah district, West Bengal. Sprawls over forty acres of land with calm and tranquil surroundings, the Math include a beautifully maintained monastery, the temple complex and also the worldwide headquarters of the Ramakrishna Math and Mission. The ashes of Ramakrishna, Sarada Devi, and Swami Vivekanada are enshrined here. It was here that Swami Vivekananda lived the last years of his brief life. There is a Sri Ramakrishna Temple at the Belur Math, separated by a transparent glass cover. It is here Swami Vivekananda placed the relics of Sri Ramakrishna. When one enters from the main gateway one can see this impressive temple. Built in 1938, it is the main attraction in Belur Math because the temple has a style of architecture that combined elements of a church, mosque and a temple. It is really a wonderful temple which harmonizes all religions. The construction of the temple took four years and Ms. Hellen Rubel, an American disciple of Swami Vivekananda provided the major portion of the funds. Inside the temple houses an idol of Sri Ramakrishna. Near to this, there is a library hall which contains all books related to Ramakrishna-Vivekananda literature and also about Vedanta in various languages. Situated to the north-east of Sri Ramakrishna Temple is an old shrine where worship to Sri Ramakrishna was conducted for more than three decades. To the southeast of this Swami Vivekananda’s room. It is here Swami Vivekananda spent his last years and attained Mahasamadhi on 4 July 1902. The articles used by him is preserved here. The room also contains relics such as his bed, sandals and turban. There is a courtyard in front of this room, there still stands a mango tree under which Swamiji used to sit and meet visitors and devotees. Swami Brahmananda Temple is the another temple in Belur Math. Swami Brahmananda was a disciple of Sri Ramakrishna Paramahansa and also the first President of the Ramkrishna Math and Mission. The temple stands on the spot where Swami Brahmananda's body was cremated. Inside the temple complex there is a smaller temple dedicated to Holy Mother Sarada Devi. The temple stands south on the bank of the Ganga because the Mother loved he Ganga. The temple of Swami Vivekananda is situated near. The temple has an upper story enshrines an alabaster OM in Bengali character. By the side of the temple is a bel (bilva) tree, replacing a similar tree after the original tree died under which he loved to rest . The samadhi or memorial Enclosure is another important building in the complex. The earthly remains of seven of the sixteen direct monastic disciples of Sri Ramakrishna were cremated here. Their names are engraved on the marble. Apart from these, the math houses the Ramakrishna Museum. It is is located to the south of the main temple.The museum contains things which was used by Sri Ramakrishna, Holy Mother and Swami Vivekananda. Rare articles used by Sri Ramakrishna, Holy Mother and Swami Vivekananda are displayed here. The ‘Old Math’, earlier known as Nilambar Mukherjee’s Garden House, stands further south on the bank of the Ganga. Holy Mother stayed here several times before the Belur Math came into existence. The Math maintains a regular schedule of meditation and puja, which guests can also paticipate. Guests can make day trips outside the math but are requested not to go the premises in the evenings. All Hindu festivals including birthdays of Sri Ramakrishna Paramahansa, Sri Sarada Devi, Swami Vivekananda and the first twelve disciples of Sri Sri Ramakrishna Paramahansa are celebrated every year.